The giant floor puzzle is a fun, engaging way to help your children learn the Armenian Alphabet. Designed for children 3 years and older. Read More. 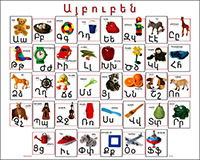 The Armenian Alphabet Poster is a colorful poster features each letter of the Armenian alphabet with a picture to accompany it Read More. A smaller version of the Armenian Alphabet Poster (8”x10”, 20cm x 25cm) This colorful poster features each letter of the Armenian alphabet with a picture to accompany it. Read More. Encourage both reading and learning Armenian! This Armenian Alphabet bookmark features the entire Armenian alphabet with colorful pictures for each letter. Read More.